Above are photos of the Red Label cake pressed with an iron mold. The left photo shows front of the cake with a symbol presssed into it. The right photo shows the back of the cake with indentations from the mold. 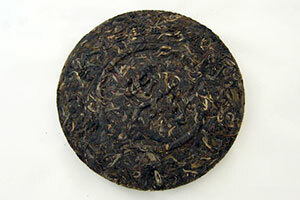 The first batch of Pu-erh tea cakes manufactured under the New China founded in 1949 was named the "Red Label," produced in 1950. This cake had two different versions: the Red Label Round Cake and the Red Label Iron Discus. 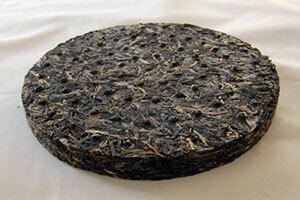 These two tea cakes have long been considered the pinnacle of Pu-erh tea, with no successor that can be considered to have exceeded their quality. The Red Label Iron Discus, in particular, used an iron mold to tightly press the leaves designed to slow down oxidation. 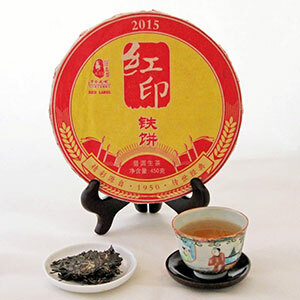 After over 50 years of aging, this tea remains rich and vibrant with a strong and sustaining aftertaste - quality that fascinates many Pu-erh lovers. Tea master Vesper Chan has been longing for a cake possessing the same elegance as the Red Label. Combined with his decades of tea making experience and the premium raw materials he has collected for many years, he put forth his best effort to re-create this classic legend. This cake adopts the tight pressed method to be in keeping with the style of the original Red Label Iron Discus and to ensure its future integrity. However, if consumed right now, this tea is full-bodied, vigorous, balanced, and intriguing - a little smoke, a little spice, then honey emerging at the 3rd and 4th infusions. Possessing the unique Menghai characteristics and a honey charm, this tea is expected to be a prized collective item in the future. Use one 5g of leaves per 6oz of water. Rinse the tea leaves with boiling water (212F) and discard the water. Start brewing with 190 degree F water and follow the suggested steeping times below.